Best Reviewed Comforters 2019 - Which Is Right For You? 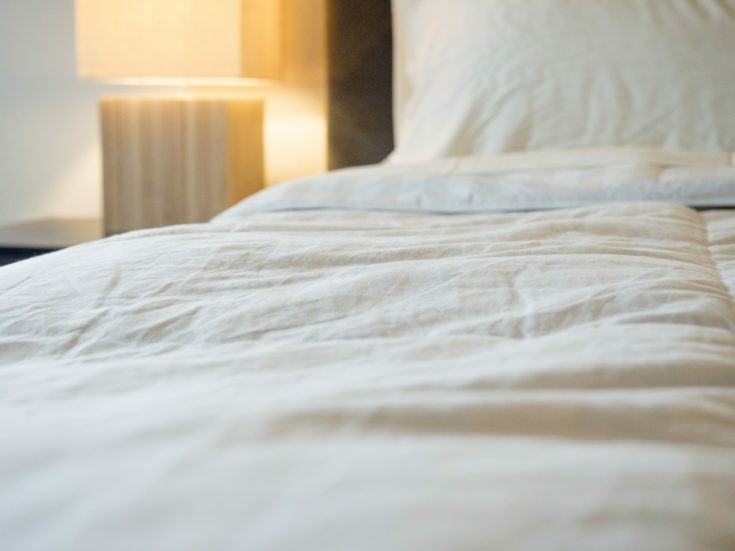 Home » Best Reviewed Comforters 2019 – Which Is Right For You? Best Reviewed Comforters 2019 – Which Is Right For You? Picking the right comforter can make all the difference when it comes to your sleep quality. Finding the perfect warmth, loft, and filling could ensure you get a long, deep sleep. While most people prefer something warm and fluffy, this feeling is not for everyone. There are many types of sleepers and many types of comforters. Because of this, the buying process can be quite overwhelming. Fear not. I have four comforters here that really stand out and could be a good match for different sleep preferences. Which one will fit your specific needs? Read on for my top comforter picks. This down comforter has a 750 fill power and a baffle box construction. This gives the comforter fantastic loft and a cloud-like quality. The baffle box construction’s double-needle stitch ensures the goose down does not shift inside the comforter. In addition, this adds a level of durability, so this should be a longer-lasting comforter. The shell is made of 100 percent Egyptian Cotton and has a 600 thread count. Because of this, the comforter has a very soft, luxury feel. This could be a great match for people who want a warm comforter without feeling sweaty or clammy. This comforter is very breathable and, while I feel cozy and warm, I don’t feel stifled or smothered. I feel comfortable, but I don’t overheat. Considering the design and materials, this is a very good deal. The Egyptian Bedding comforter is currently priced at $109. A comforter of this quality could easily cost upwards of $300. The Superior Comforter incorporates baffle boxes and double-needle stitching in its construction. This keeps the polyester filling in place, makes the comforter more durable, and allows for maximum loft. Overall, this down alternative comforter has the lofty feel of a down comforter. 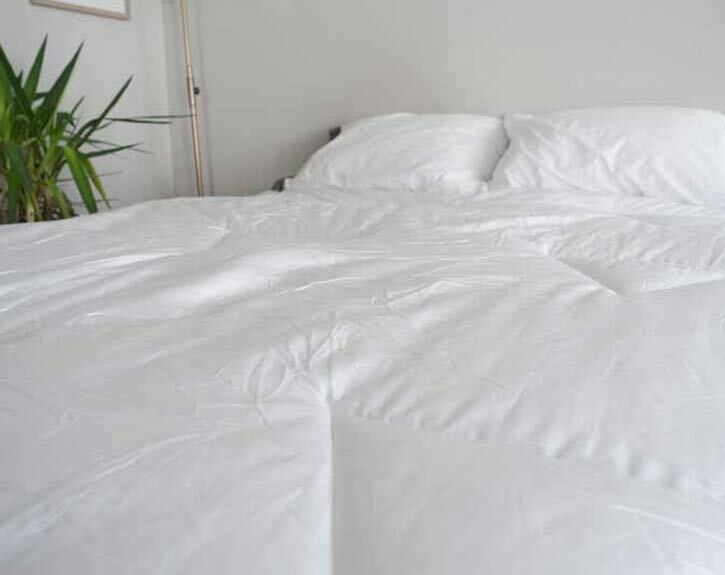 Down alternative comforters often feel thin and can feature cold spots. This was not my experience with the Superior. It feels warm, cozy, and fluffy. This comforter eliminates some of the drawbacks of a down comforter. First, sleepers who struggle with allergies shouldn’t have issues with the Superior. Down is known to trap dust mites, pollen, and other allergens. The comforter features a Down Alternative Polyfill that is hypoallergenic. You shouldn’t have to worry about watery eyes or a stuffy nose while using this comforter. Down alternative comforters are usually more affordable than down comforters, and that is the case with the Superior. It is currently priced at $50, so you get a fluffy comforter without having to pay for down. Not all comforters need to be warm and fluffy. This down alternative comforter is a great pick for hot sleepers or those seeking a warm-weather comforter. I personally felt very cool sleeping under the Natural Comfort. 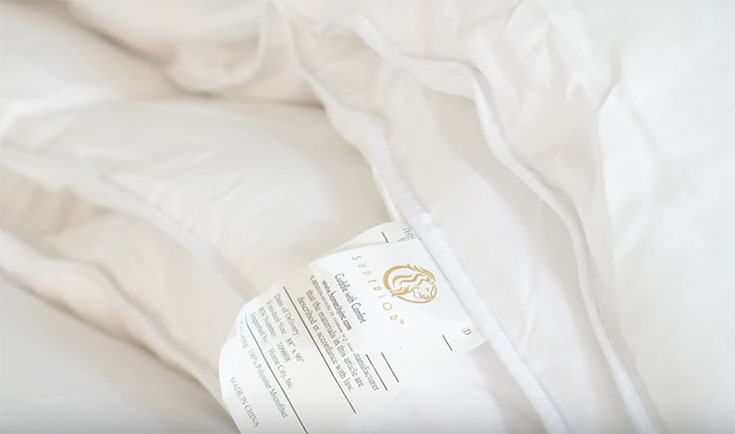 One of the reasons this comforter doesn’t sleep hot is because the fill weight is only 29 ounces for a Queen size. This is quite light, especially for a down alternative. The shell is made with an embossed microfiber. It is smooth and cool to the touch. It is also breathable; together with the light filling, I don’t feel sweaty or clammy under the Natural Comfort. It is designed specifically for hospitality. 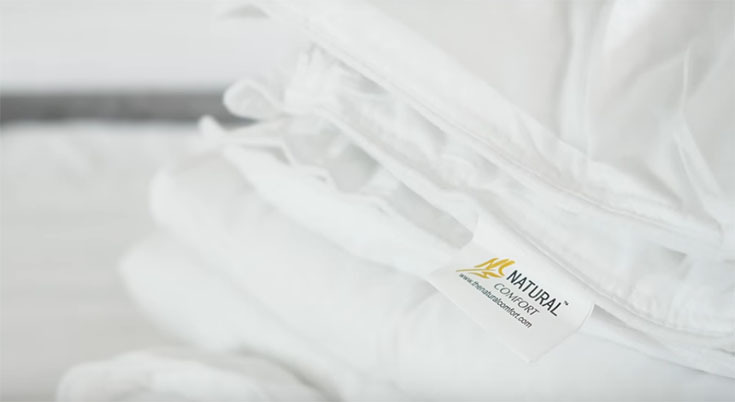 If you like the feeling of a hotel comforter, the Natural Comfort could work for you. The polyester fill is hypoallergenic, so those who struggle with allergies shouldn’t have a problem using this comforter. The comforter is currently priced at $43, so you get a light, luxury comforter for a value price. Out of this group of comforters, this the most affordable. The current price is $30, which is quite a deal for a medium-weight, down alternative comforter. While the LinenSpa is advertised as “all-season,” I believe it may sleep rather cool for winter months. I tried it in June (when the weather in Austin was in the 100s), and I did not overheat. Also, while using it in the fall, I felt warm and comfortable. The cover is soft, so it can easily be used on it own. 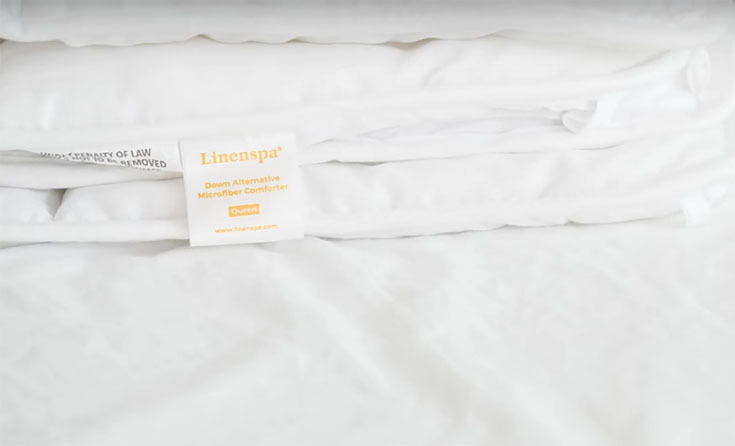 If you prefer to use a duvet cover, the LinenSpa has eight tabs sewn around the outside edge. These will help you secure the comforter inside the duvet cover so it doesn’t shift. Out of these comforters, the Buffy is best for the environment. It features responsibly sourced eucalyptus and fill made from recycled bottles. Eucalyptus has anti-inflammatory properties and can help keep your skin smooth. The comforter is very soft to the touch. The comforter also includes 37.5 technology which is designed to regulate your body temperature. If you heat up, it cools you down. If you get too cold, it will warm you. The fill is hypoallergenic so those struggle with allergies shouldn’t have issues with the Buffy. What Should You Consider When Buying A Comforter? When it comes to your comforter’s fill, the main choice you have to make is between down and down alternative. Down is taken from underneath the feathers of ducks and geese. It is a natural insulating material. Down alternative filling is made from synthetic materials (such as polyester) or other natural materials (such as cotton). Down is usually more expensive than an alternative option. I’ll touch on more specific benefits and drawbacks associated with each type of comforter in the following sections. Down is usually more insulating than most alternatives. Because of this, you need more down alternative filling to equal the warmth of down. Basically, down comforters can be lighter and still give you a good amount of warmth. Down is also more breathable than alternatives like polyester. With down alternative comforters, you may get clammy or sweaty while you sleep. Down is both warm and breathable at the same time. While you need to first pick between down and down alternative, you should also consider how much warmth you really need. For example, you might consider: Are you a hot sleeper? Will you be using this comforter during winter or summer? If you need a summer comforter, a very lightweight down alternative comforter work. Knowing exactly what you need will save you a lot of energy during your comforter search. When you’re shopping for a comforter, you will undoubtedly come across the term “fill power.” This is basically a measurement of loft. More specifically, it measures how much space one ounce of down fills at full expansion. The higher the fill power, the greater the loft. Anything from 500 to 750 is considered good fill power. If you get over 750, this is excellent. You also need to consider the amount of fill in a comforter to really understand how lofty it will be. For instance, an 800 fill power comforter with only 30 ounces of filling could be less lofty than a 700 fill power comforter with 60 ounces of filling. You may also see down alternative comforters with an advertised fill power. However, it is very difficult to compare the fill power of polyester to that of down. They have different properties, so be careful when judging the fill power of down alternative comforters. Two other terms you will come across are “sewn-through” and “baffle box.” These refer to the way the filling is sewn into the comforter. Sewn-through is when the two sides of the comforter are sewn directly together. The down or synthetic fill is held in an almost two-dimensional square. A baffle box is created when an extra piece of fabric is sewn between the two sides of the comforter. This creates a three-dimensional space for the fill. With a baffle box construction, there is more room for the fill to fully expand. Even if you have a comforter with a high fill power, you want to make sure it can reach its maximum loft. As a general rule, baffle box construction allows for greater loft. 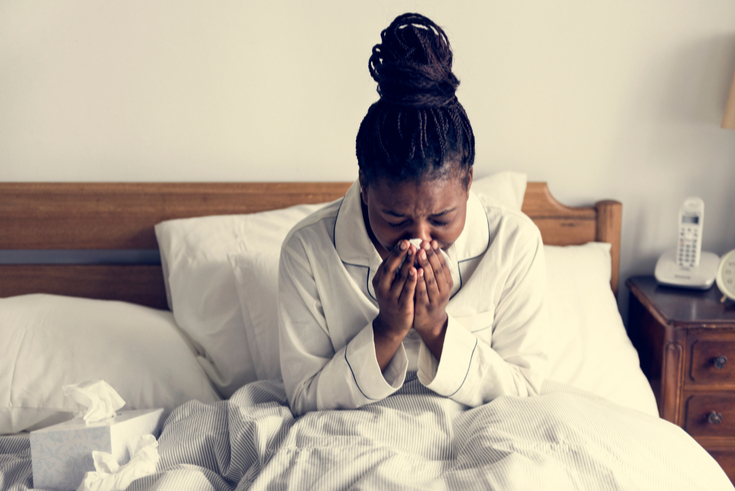 While down comforters are usually superior in warmth and fluffiness, they do have issues when it comes to allergies. Down easily traps allergens such as dust mites and pollen, while down alternative does not have this problem. You will see down comforters with hypoallergenic covers that are meant to stop dust and pollen from moving into the fill. Other down comforters advertise that their fill has been washed many times. However, this is still not as reliable as a comforter with synthetic fill. If you struggle with severe allergies, it might be worth considering a down alternative comforter. Buying a comforter doesn’t have to be a chore. If you consider the information above, it shouldn’t be difficult to find the right comforter for you. Consider the temperature of your room, your budget, and other preferences and you’ll be sleeping under a cloud in no time.